This Solwave commercial microwave with push button control is a perfect way to save time and provide quick heating capabilities at your concession stand, lunch room, snack bar, coffee shop, or other quick-serve establishment. This easy-to-use, light duty unit boasts 1000 watts of microwave power that is ideal for warming soups, sandwiches, prepackaged lunches, beverages, and more. So disappointed in this product. At first we loved the commercial grade and the look. Very easy to clean. HOWEVER we have had this less then a year and is not working. This is equipment we only use 3-4 days a week at less then 10 mins total a day. No excuse at all. We bought this microwave when ours gave out on us, being a business we had to make a quick purchase to replace it but the reviews were so good on this product we thought we'd give it a try. It has yet to disappoint! We love the programmed settings, the inside is large enough to fit our large mixing bowls in and it fits perfectly on our counter. A wonderful machine! This microwave has been an amazing replacement from the old cheap old one we used to have. I like the convenient preset times that start with the press of button. A great microwave for the money. It came well packaged and was in perfect condition upon arrival. It will definitely stand up to constant, daily use. This microwave by Solwave is perfect for use in a commercial kitchen. At 1000 watts, it heats and reheats very quickly and evenly and operates quietly. Highly recommended. We have this exact microwave in several of our Boomers! locations, they are very durable with an easy to clean surface plate on the inside.. Nice stainless steel, stays clean if maintained. This microwave can keep up, Trust Me!! 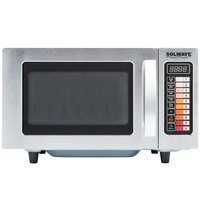 This Solwave Microwave is great! Pros: - Energy efficient; the microwave turns off automatically if not in use, and when you open the door, it turns back on immediately. - Very customizable; varying levels of heat, and timer control sets so that you can set it to whatever your shop needs it to be. - Great Design; we have used this for a few months, and it has stayed very clean, and because there is no dish rack and exterior is made with stainless steel, clean up is a breeze. Love this microwave! We use it in our restaurant for many things and works great. The only thing is that the heating element is from the bottom, so you have to be careful when melting butter and such, as it heats from the bottom first. Otherwise, great product, good size and easy to use buttons. Would recommend. We purchased this unit stopped working once under 3 months and we were sent a replacement which is working but its light is gone just over 6 months, unfortunately it has only 6months of warranty on this product which is way less than any commercial microwave. Quite disappointed. We appreciate your review, Gloria! We are sorry this microwave is not meeting your expectations. If you are looking for a recommendation that would better suit your establishment, please contact our Customer Solutions team. This microwave is cheap but the quality is not good. I bought one and it was not working good since day one. Call webstaurant to get replacement but it worked about 6 months and not working again. It is cheap but buy at your own risk. We appreciate your review, Vatana! Our returns team has deemed this product defective and will be assisting you with the return process. Great microwave. We like this one better than all the others we have had. I was skeptical because we had not heard of the brand name. But it works great. We have used these microwaves for a few months at our bakery and they have been holding up really well. Very happy with the quality of the product. We actually got this to replace an identical one that has been used thousands and thousands of times. The original actually still works but was taking longer and longer to heat. This new one has us cranking things out faster than before! Very user friendly and quick to use with one-touch time settings. This microwave is the perfect size for larger orders and ultra-functional. It heats things quickly and evenly, making sure that our orders are put out perfectly each time. This microwave lasted less than one year under very light use. It lasted just past the 6-month warranty, of course. I would definitely not recommend this microwave at this time. We ordered this commercial microwave and received it in November 2017. It only worked 3 months and stopped working on March 14th 2018. Very poor quality and disappointed on this product! I will not recommend this microwave to anyone. Our shop has only had this microwave for a couple of weeks but it has been working well. The time programmed options make it quick to use and it is very easy to clean. The best is simply the best Solwave. The Solwave Stainless Steel Commercial Microwave with Push Button Controls allows my staff the flexibility to do the job fast. This is very compact for the power output. Seems to hit the right spot for what we use it for, heating up desserts, pies, brownies, ect, for a la modes. Basic and easy to clean. Down side is uneven heating because there is no turn table inside. Not an issue but no clock when not being used. Packed well, shipped quickly, and delivered in two days! It works really well so far! I had a big in-depth review, but it didn't upload. I will try attaching pictures and video again. if it works, I'll add more information here. A very good microwave with nice look and excellent performance. I recommend this item for people that want to have a heavy duty microwave with no spending a fortune. we use this microwave on a daily basis. we love the one touch start buttons on the preset times. they have lasted about 4 years for us so far. This microwave is extremely affordable and does exactly what you need. We use this everyday during service and it warms things up just how we need. Bought this as backup for existing Panasonic. It is as nice! I like the stainless interior and quick one button start. Had it for one week and no issue for now. So far so good! We bought 3! These units are used a lot in our kitchen, for warming food products. They have been taking a beating for the past 9 months. I would recommend them, especially for the price! A pretty good microwave for the price. We use this for our desserts and other small items the servers need to heat up. It has easy to read buttons, pretty sturdy door and seems worth the price. It is a great smaller light use microwave. Great easy to use commercial microwave. Don't buy the cheaper one with the dial. The dial wears out over time and becomes harder to spin and use. Love this microwave. It is our second we have purchased. It works great and is easy to clean. I really like that it has preset buttons you just push and it turns on for a certain amount of time. This microwave fills a need in my restaurant, and I like that it has programmable buttons. It has two negatives: First that it does not include a CLOCK. Every microwave I have ever owned (at home or work) has included a clock, and I have sorely missed this feature. Secondly it is surprisingly low-power and takes a long time to heat even a piece of bread. Great basic microwave. Like the preset times as most of the items we microwave fit one of the per-programmed times. But if not you can easily type in your desired time. Great little microwave. Perfect size for our food truck. We bought it for heating up breakfast burritos and it works great for doing that. Thumbs up! Great microwave! This is a very quality product. Has several different cooking options and heats evenly. Highly recommend this product if looking for a quality microwave. This microwave is perfect for our small needs. It works great! It doesn't take up much counter space and the buttons are labeled for quick one-button starts. Bought this microwave 7 months ago for my restaurant. It works good, We use it all the days we are open through out the day. It is great for heating up food and defrosting foods. Easy to use and clean. Great price for a commercial unit. Delivery was faster than expected also, which was a plus. Great Microwave! It heats quickly and evenly. I like the preset times on the buttons but it also has the custom option when needed. It is easy to clean. Looking forward to buying a few more! We are very happy with this microwave. It is well made and cleans easily. We do not use a microwave often in our kitchen so the price of this unit helped us decide and we were pleasantly surprised. Small and compact but efficient and simple to use. Its size is perfect for our space and it's just what we needed. Finally upgraded after ours retired after many years of service. Commercial Microwave is well built and very easy to clean. It is very heavy duty but still a 120 Volt. Great looking unit and economical! I cant say enough about this microwave, easy to use, nice to look at, easy to clean. works great! I just may buy one for my house! Have had this microwave for about 3 months now. It has been great! Heats really fast and is easy to use. It is a smaller unit but still fits a good size bowl in. Easy to clean also! Purchased this to put in Teacher's lounge. Microwave stopped working a few days after the one year warranty. It seemed to work okay up until that day. Just disappointed with the short life. We had just replaced our microwave after a year and using this microwave from about a week. It turnout to be pretty good microwave for our as an average 60 guest. It is easy to operate and clean. I would definitely recommend this product to everyone. This microwave get used often and every day at my deli. Great quality and can't beet the price totally worth it. I'm thinking about purchasing another one as soon as I can make the room for another. I was a little weary of this microwave because it was such a great price, but it's super convenient to use with all of the preprogrammed buttons, I bought a second one today! Solvable outperforms Amana 100%. Don't waste your money on a more expensive brand. These puppies will be running long after your Amana but the dust. The Solwave Stainless Steel Commercial Microwave is a solid choice for an occasioinal use microwave. The push button controls are very efficient to keep prep time to a minimum. This lasted a year. It rattles big time and takes a while to heat things. I would pay the extra and stick with the brand that makes only microwaves. We appreciate your review, Rosemarie! If you are having any issues with the product you have purchased, please contact our Customer Solutions team. This microwave is perfect for reheating and just about everything else. It heats very evenly and heats up fast cut my prep time down considerably. Great microwave for the price. Easy to read preset timers. Could use a longer electrical cord, I placed mine on a microwave shelf about 5' feet from the floor and need an extension cord. Great micro wave for the money. Works as it is supposed to and has a small foot print. Shipping was super fast. Thank you ! Great Microwave especially for the price. I was worried about the "uses per day" guidelines but we had this thing wide open most of the day constantly warming items and it didn't skip a beat. May get a few of them if business continues to pick up. This microwave is simple and easy to use. We use it to warm up certain foods that is in the fridge - usually we use a maximum of 2 -3 minutes of warming time at a time. This is suitable for our small kitchen and sits easy on our shelf. Great microwave, great price. As a bakery we do not make heavy use of it but it definitely does a good job. We can absolutely recommend it. Had to order this one because the ones I usually use were out of stock. This one was much cheaper so I was a little skeptical but I was pleasantly surprised. Easy to program and works great! You can't beat the price on this commercial microwave. My residential one cost way more than this. Looks nice and well built, should last awhile with moderate use. Fits nicely on the Regency 24" x 18" microwave shelf. The power of this microwave is great it does a outstanding job with fast heating and the ease of use makes it a must buy! Very happy with this microwave. It is very efficient and easy to use. It is also very easy to clean and cooks food very quick. Would highly recommend for the price. I compared many NSF microwaves and purchase this one mainly due to the cost. It offered the same functions as the higher priced ones. I won't use it often but it has the main features that I needed such as the presets. Great price for a unit that is NSF. I think that I spent almost as much as the one I use in my home. Great microwave! I don't own a restaurant, but I have always bought commercial appliances for my home since they last longer and are better built. I originally had a Solwave MW1000D for 4 years and had no issues and I ended up giving it to my daughter and upgraded to the touch button on this model. Easy to use and heats up food fast! The Solwave Microwave was easy to set up and even easier to use. We don’t use it often but when we do it gets the job done. it’s powerful and efficient for it’s size. Perfect edition to any commercial food establishment. Just over a year of service and it still holds up well. This is the only microwave in the kitchen that gets a lot of use especially during peak service time which total 5 to 6 hours per day. This microwave that I have is comparable to Amana in quality since I have bought at least 6 Amana's previously that were in the 400+ price tag. Cleaning is easy and having factory program buttons is a plus. we have this microwave mounted in our food truck. It gets a lot of use and works great. The best feature is the cool down fan after each use. Nice size microwave for restaurant. I wish the bottom tray slide out for easier cleaning. The buttons are large enough to review time selections and are color coded for speed. We use this microwave for almost every order. The light bulb burnt out within a month of purchase and a replacement isn't the easiest to find. Besides the lightbulb, it works great and is easy for the staff to use. We have ordered a second one as demand required. Not sure how my business functioned before purchasing this microwave. It is so easy to use and warms wonderfully. I was so used to having to warm things on the stove but now am able to put them in here and move onto something without any worries. This microwave worked fine for 3 months, now the beeping doesn't work so we do not know when the product it is finished being cooked. Thank you for your review, Todd. We are sorry the timer no longer works on your microwave. A Customer Solutions Representative will contact you shortly. Thank you for reviewing this, Stephen! We are sorry that the microwave arrived with damages. A Customer Solutions Representative will contact you shortly to resolve the issue. Powerful and efficient microwave. It doesn't take up a lot of space and has a clean appearance. It is very useful for quickly heating things up. This is a great Microwave. I use it in my home. It has lots of built-in settings and is easy to program. It works great. Nice microwave. Easy to clean stainless steel. Easy to operate touch button controls are nice. Hopefully it is as durable as it looks from the outside! Great Commercial microwave. This unit stands up to the use but costs a fraction of other microwaves. Push button controls are easy and intuitive. Definitely recommended. I DO NOT recommend anyone buying this. Absolutely terrible. It worked for maybe 4 months and then broke. Shorted out. The company only offers a 90day warranty on the item. So they will not replace or refund. Again I do not recommend this item. I am VERY disappointed. Thank you for your review! We are sorry that the microwave broke after such a short time. This microwave is listed as light use only; for use exceeding 50 times a day, we suggest taking a look at our Medium Duty Commercial microwaves. I have bought 3 or 4 of these. I love the stainless interior thats the pros (as purchased more of them as they have died). The Cons they do not last very long under average use, and come with a small warantee. The last one just died Friday night and just 10 days over the warantee. Thank you for your review! This microwave is designed for light duty use only. Our experts recommend you try a Medium Duty Microwave. These feature higher wattage and all stainless steel bodies that are suitable for up to 150 uses per day. The delivery is on schedule. This microwave is just perfect for a regular size kitchen, it is not intrusive. Also, it handles very well with 4 teenagers who are always hungry. Beautiful and functional. Great piece of micrwave oven. Great microwave, love the stainless interior, and it is a nice compact size for my front counter area, perfect for my low usage in my bake shop! Great value. I haven't had any issues in one year of very heavy use. I would definitely buy this microwave again. Easy to use, easy to clean. Great product and speedy delivery. The website is easy to navigate and special offers inspire menu ideas. I will definately order again. Thanks Scott H.
This is a great microwave for a break room or employee lounge. It is easy for just about anyone to use and is very powerful. Great for heating up a quick prepared lunch.